Fiona and Geraint were delighted. 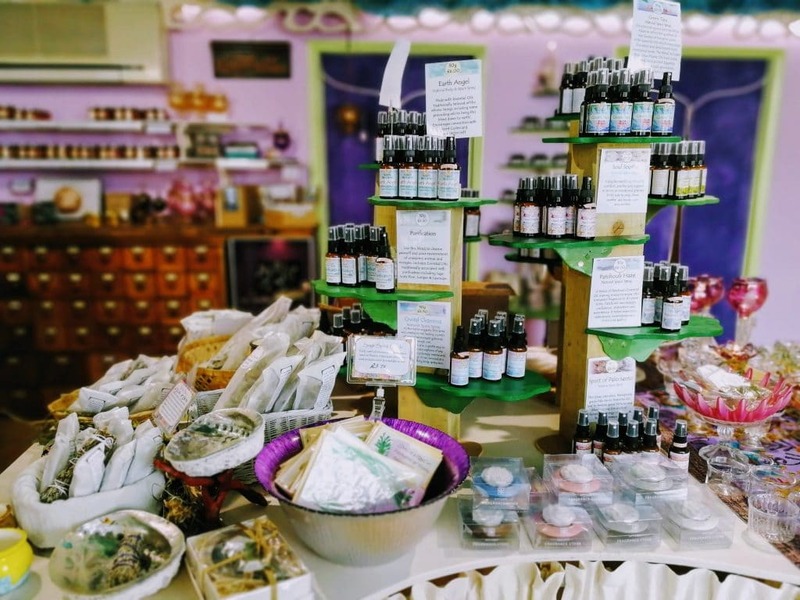 Their dream of opening a shop in Glastonbury, called Fairyland Aromatics and dedicated to their shared passion for essential oils and beautiful glassware, was within reach. Visiting Glastonbury in Autumn last year they felt the town “reached out and grabbed us”. 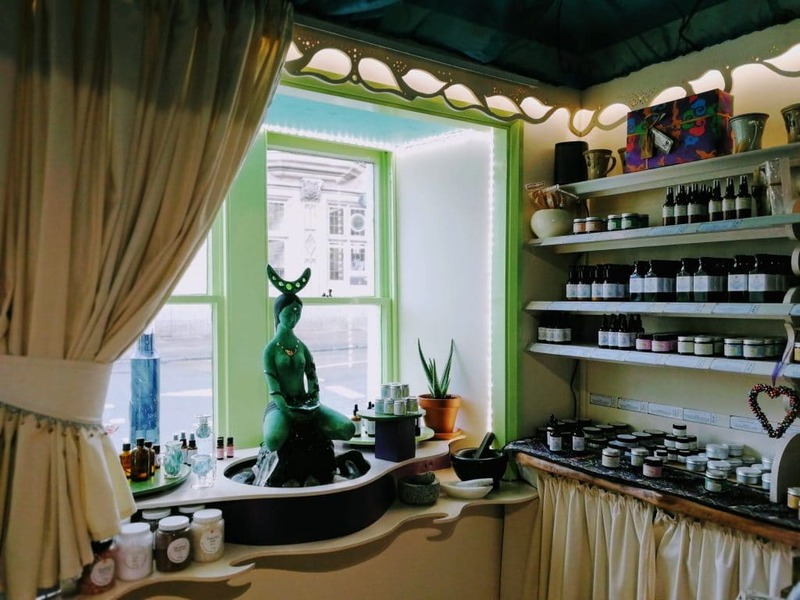 The perfect shop had just come up for rent, “We felt like it was for us. We knew it would be popular, so we had to say yes immediately. Many of our friends thought it was the most impulsive thing we’d ever done”. Fiona has been visiting Glastonbury for over 30 years, we realised that we’d probably met in 1993 when we both used to stay on the Ashwell Lane campsite at the foot of the Tor. She met Geraint in 1998 in Scotland, their first holiday together was a visit to the town on his BMW X650 motorbike, it was his first time in Glastonbury: “I was blown away by the feeling and the energy of the place”. Fiona says “I feel Glastonbury is like a person, they interact with you, they know you. Glastonbury was saying it was time for us to come here. I listen to my intuition, it all felt right”. Having found the premises they planned to paint the exterior in the striking colours of their brand. However, they wanted to make sure their bold colour choice would not land them, or their landlord, in hot water. They phoned Mendip Council and asked what the rules were regarding painting a Grade II listed building. “We’ll get back to you within 48 hours” promised the Planning Department. The promised call never came, so they rang again and again. They concluded that MDC weren’t bothered, as they didn’t reply to any of their calls. The couple searched the Historic England website and found nothing that prohibited bright colours. They checked out other Grade II shopfronts on the High Street and noted that quite a few of them were brightly painted. It appeared that colourful buildings were perfectly acceptable in this special and unique town. So they went ahead. The lavender brickwork and ‘dream grass’ green woodwork certainly made the building stand out. I’d spotted it from Archer’s Way while it was being painted in November last year. Following so soon after the kerfuffle over the repainting of the Heart Land Tattoo Temple at the top of the High Street, I had a feeling there would be controversy. So I took photos and held a light-hearted poll on the Normal For Glastonbury Facebook page, over 1000 people voted – with 433 going for “Arghh! That’s horrible! !” and 604 saying “Oh bold! I rather like it”. Not only were a clear majority of Normal For Glastonbury followers in favour, but generally even those who said it wasn’t to their taste felt it wasn’t inappropriate for the town. After the painting was finished the couple’s landlord, David, received a letter from Mendip District Council, telling him that if the paint job wasn’t repainted black and white, they’d be serving him with a notice, then going for prosecution. David is not a pushover, the indignation is clear in his voice when he tells me “This is Glastonbury. It’s unique! Bureaucrats don’t understand uniqueness! I want to see where it is written in law that this building has to be a particular colour”. Fiona and Geraint spoke to the Enforcement Officer at the council, they asked what bye laws or official guidance they were infringing with their colour scheme. The officer couldn’t answer the question beyond telling them that, in his opinion, the colour wasn’t appropriate. 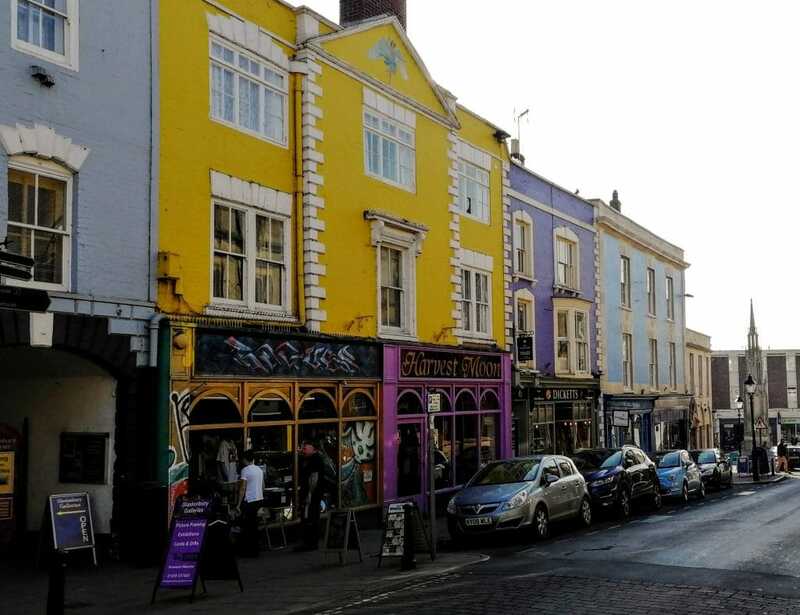 The council did cite the Town & Country Act but it doesn’t in any way offer guidance on colours for historic buildings Fiona felt bullied and discriminated against, other properties had been brightly painted in the town, why should the one she was renting be any different? Eventually the officer admitted that they could apply for retrospective planning permission. 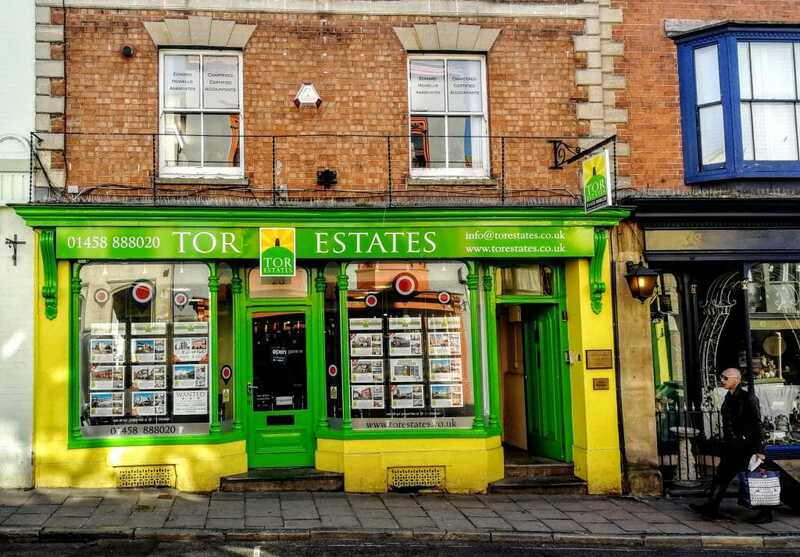 They were fully stretched moving their home and business to the town, travelling back and forth between their old house in Scotland and the flat they’d rented in Glastonbury and didn’t appreciate being caught in this unexpected bureaucratic wrangle. They aren’t new to living in magical places. They lived for a while in Aberfoyle – Scotland’s Fairyland, known for its famous fairy hill and home to the 17th Century folklorist Robert Kirk who wrote The Secret Commonwealth, a treatise on fairy folklore. Kirk was believed to have been abducted to Fairyland upon his death. They’ve a story about that house in Aberfoyle that made the hair on my neck stand on end, perhaps they’ll share it with you if you ask. You can ask Fiona about the fairy beings she’s seen in Glastonbury too. 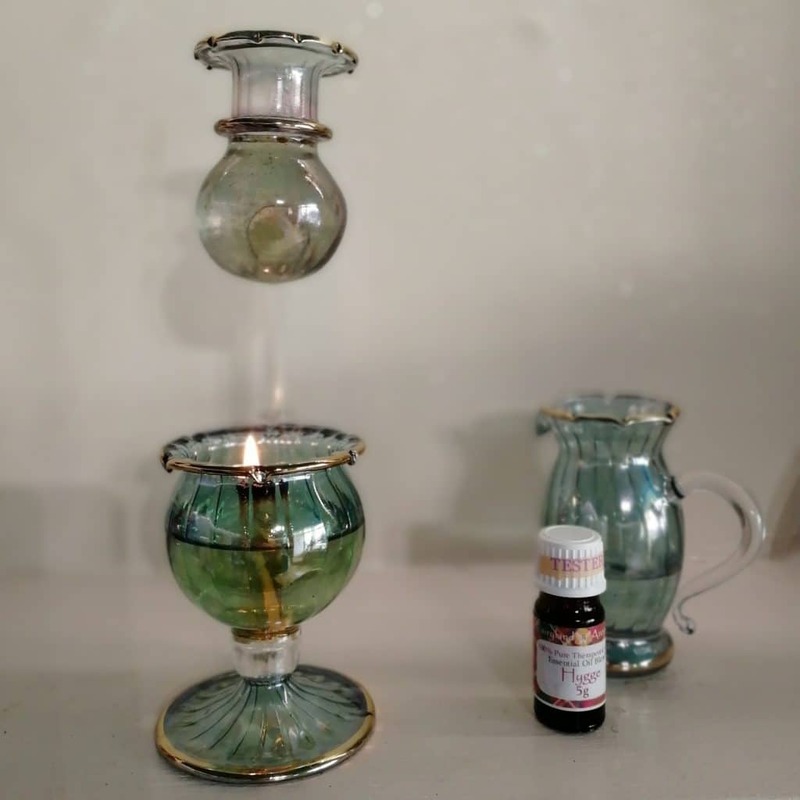 The shop finally opened in February and sells unique glassware from Egypt – beautiful delicate perfume bottles and oil burners. 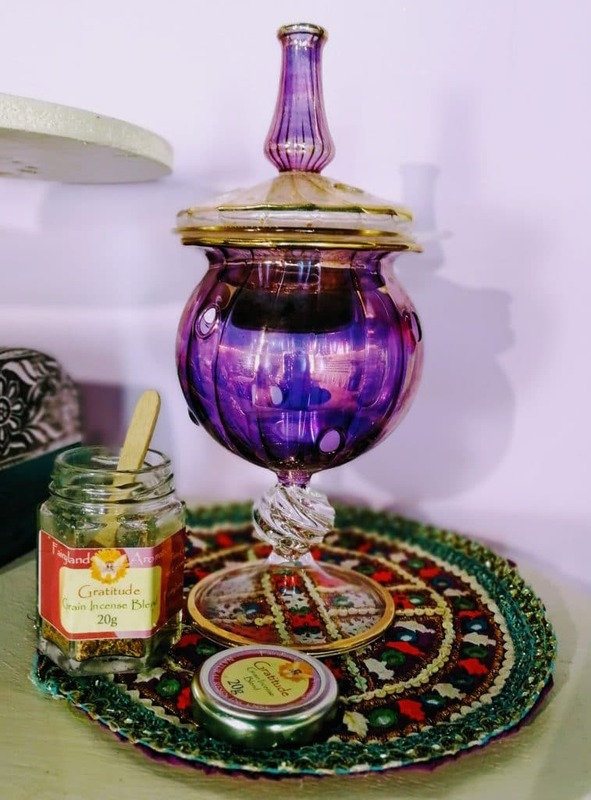 One glass burner has a particularly innovative design where the grain incense is heated on sand, making it smoke free. Fiona buys these direct from the producers, making sure the workers are paid a fair wage. The business doesn’t use paraffin products, the tea lights are made from vegetable oil and over the last couple of years they have moved to biodegradable packaging. I was concerned that their experience with the council may have soured their feelings about the town and made them feel unwelcome, but fortunately that’s not the case. Geraint tells me “People in Glastonbury have been friendly and lovely, lots of people have come in and expressed support”. One visitor told them about the changes to the High Street in the 1990’s. Jan Morland, who owned Glastonbury Galleries had been favourably struck by the brightly coloured buildings on a visit to Ireland, on her return to Glastonbury she persuaded Glastonbury Town Council to not only approve the painting of several of the shop fronts in town (most notably 2 to 10 High Street), but also to fund the purchase of the paint. The couple did approach Glastonbury council, in the hope that they might help them plead their case that brightly coloured shops are not unprecedented or unwanted in the town, but they were told to bow to Mendip’s demands. They are now going to apply for retrospective planning permission as they don’t want their landlord fined and “It seems like the only way we are actually going to get to talk to Mendip District Council”. “Back in the late 60s and early 70s, my parents had some real opposition to their painting of the flowers on the Pat Li Shun shop and printworks at 88 & 90 High Street. As it was before the 1974 local government reorganization, it was presumably the Town Council that objected. My dad, always one for a (non-violent) confrontation, made the points that the new health centre opposite was so ugly that someone had to do something to distract attention from it, and that as they had not painted any words on the walls, they were not in breach of advertising consent. Eventually it seemed that the ‘shop with the flowers on’ was seen as an asset rather than a liability. They were fortunate in that the building was not then a listed property. When the shops further down the High Street were painted different colours, I recall there being early opposition but now no one seems to notice”. 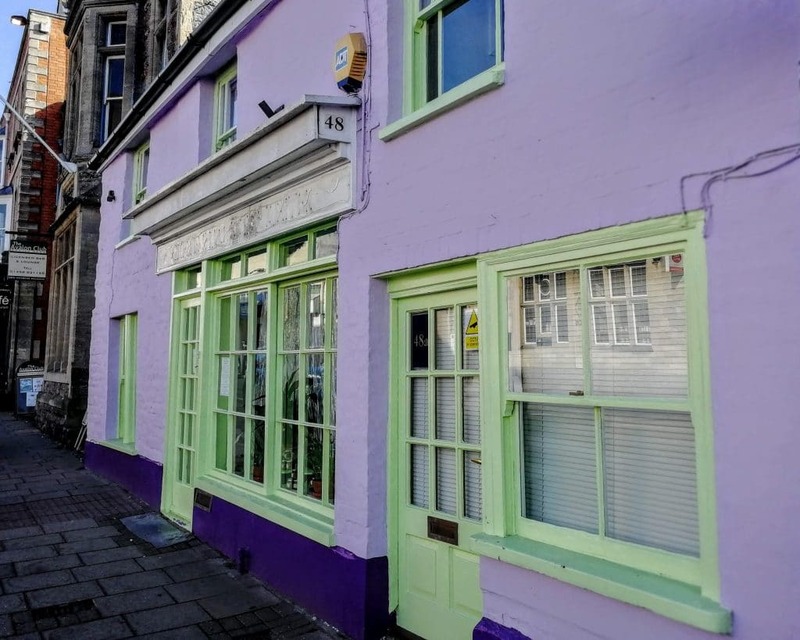 Just some of the brightly coloured shop fronts in our High Street – Glastonbury Town Council even paid for the paint. Geraint tell me “We don’t want to give in to black and white, or grey. We don’t want to help set a precedent where Glastonbury becomes bland like every other town. It’s a bigger issue than just us. We’d consider other colours – we could change the dream grass colour to a sage, a more historical green, but we’re not going to be bullied. You can’t look at all the colourful buildings in the town and justify discriminating against us. It’s a step backwards for the town. Glastonbury seems to be thriving, to try and stop that seems bonkers”. It’s interesting how many stories I’m hearing of people feeling bullied and intimidated by Mendip’s officers. The Heart Land Tattoo Temple, Green – Glastonbury’s Wand Seller and now Fiona and Geraint, all people who want to contribute to making Glastonbury more colourful, magical and unique. Willing to follow the rules, if only someone would tell them in advance what the rules are. Mendip District Council Officers might find their jobs easier if they simply spoke to people before problems arose. I think it perfectly possible that they would find solutions that pleased all parties and suited the character of the town as it is, rather than turning the dial back to the 1950’s and bullying those who don’t share their lack of vision. 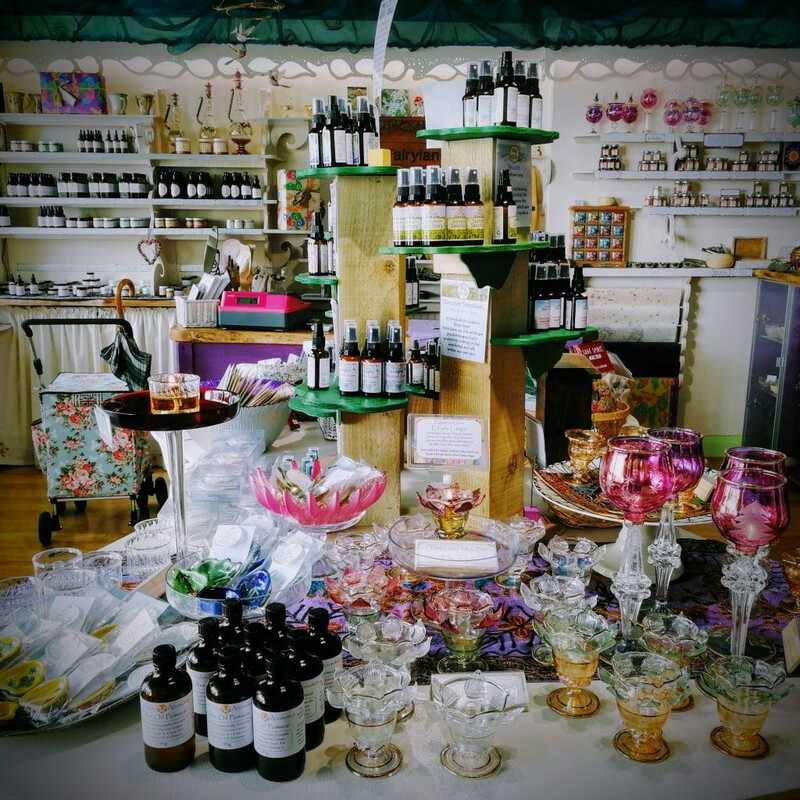 To find out more about Fairyland Aromatics go and say hello at the shop in the High Street or check out the website at Fairyland Aromatics. I personally think the green is a rather acid and ugly colour but I also would like to see more colour in Glastonbury and not less. Our town is joyful and that’s not a sentiment that is easily expressed in black and white. Maybe tone down that green though! Thanks for your comment Barbara, to be honest it’s not my favourite colour combination, but for me this is about who gets to decide what Glastonbury looks like. I don’t believe that one person from Mendip District Council should have the power to decide. This post was also a call for civility and discussion. So often lately, it seems that MDC are being heavy handed in the way they deal with people. I think a lot can be achieved with discussion. 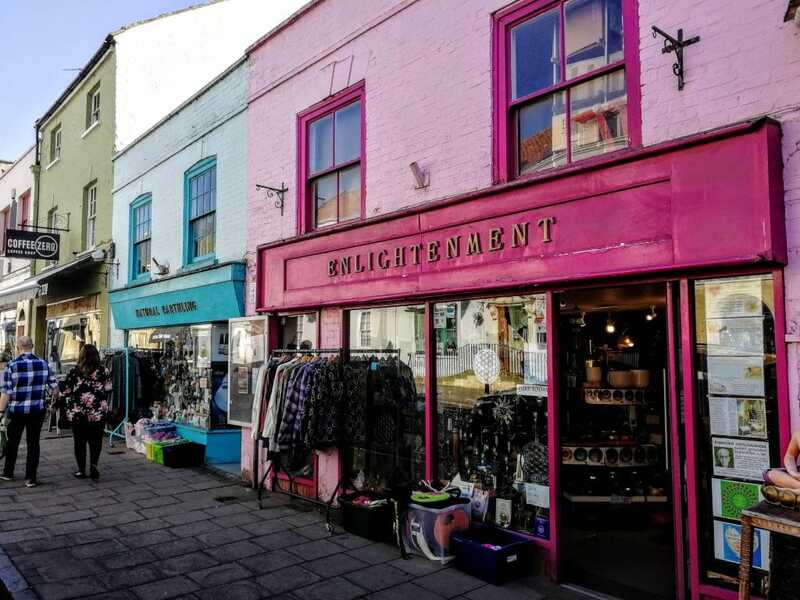 Dear Sir or Madam; the sooner Glastonbury in general, and the High Street in particular, is once again returned to proper grey uniformity and conformity, the happier people like me will be! Yours faithfully, A. Dullard. I agree – keep Glastonbury colourful. Glastonbury is unique in this country and that uniqueness is what attracts the hundreds of visitors to the town. Black and grey just does not do it. Wake up MDC and appreciate what we have. I visit Glastonbury because it is different. Otherwise I don’t think I would be returning regularly. Same as many others. It’s this kind of thing i expect to see in the town. I’m not offended by this at all. ive just tried to leave feedback for mendip council “I want this passed on to the relevant department please re. painting of buildings in Glastonbury. Colourful buildings make a town a special place, murals ad interest and show the skill of local artists. 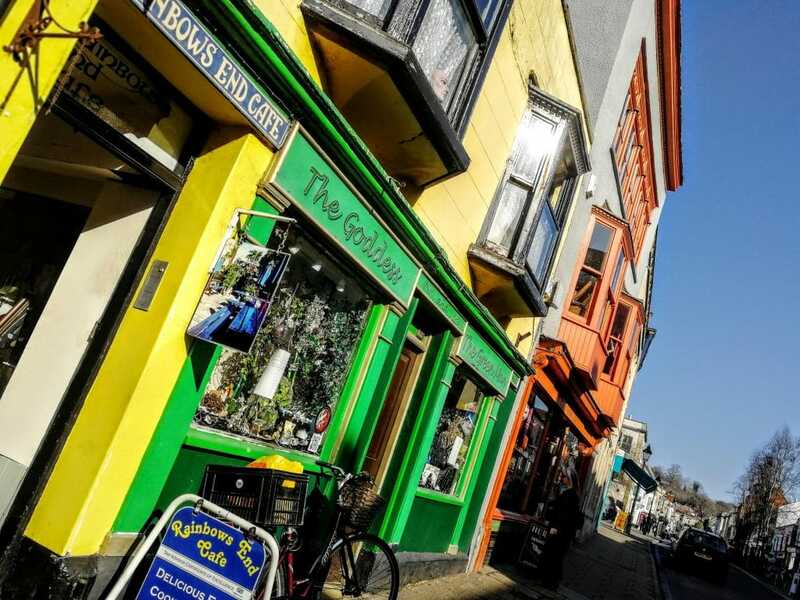 There is no lawful reason why the shops in Glastonbury are being hassled by Mendip Council and are being threatened with fines if the colour or design isnt to the liking of the enforcement officer. It’s a Brexit thing and therefore an age thing. Remainers are mostly young and vibrant and like colour and diversity. Brexiters want it all back to how it was in 1942 when most of them were born.